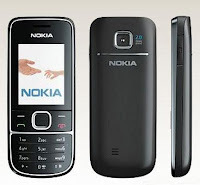 The elegant Nokia 2700 classic has handy features to keep you connected and entertained throughout the day. With the built-in music player and FM radio, you can easily enjoy your favourite tunes on the go. The 2 megapixel camera and 2" QVGA display let you capture and relive images in clarity. Email, SMS, MMS, and Nokia Xpress audio messaging offer you a variety of ways to get your message across. With up to 2 GB of additional memory when using an optional memory card, as well as microUSB, Bluetooth, and GPRS connections, you can easily store and transfer your data. The included Share on Ovi, Windows Live Messenger, and Opera Mini browser applications make it simple to keep in touch with those close to you. * Windows Live support ""Mobile QQ (China)""